Chapter 5: Implications and Conclusion, including implications of the findings, limitations of your study (if any) and recommendations for future research. As shown in the above diagram, end to end shipping cycle (Movement of container from shipper to consignee) is divided into 5 main activities, based on which the shipping industry would have following categorization for the various operators. Revenue share for the FY 2007 is also shown for the various segments and the ROCE (return on capital employed) is also indicated in the diagram. Note that there are players who operate in all the segments of the value chain wherein few entities operate in a standalone manner by focusing on a single segment of the value chain. Container Providers: This segment of the value chain consists of ownership, leasing, storage services and maintenance of the containers and chassis. 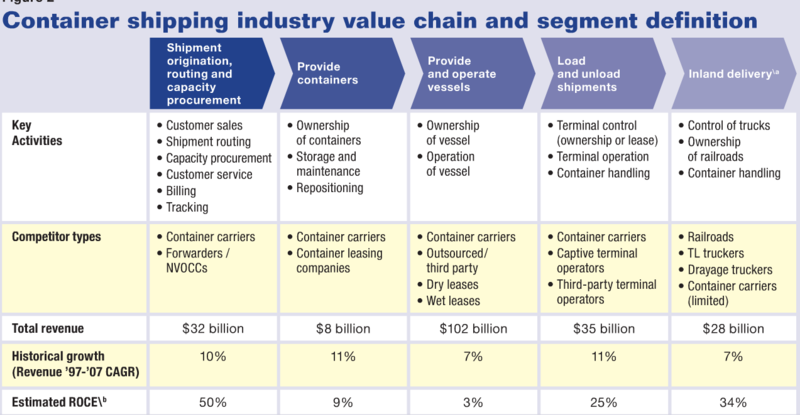 Players in this value chain segment are termed as Container Carriers. Containers are either purchased and maintained by the carriers internally or they may opt to outsource these services. Maersk Line, CMA CGM and Mediterranean Shipping Co. are three major container operators. They hold more than 27% of the trade in US laden container trade. (The Journal of Commerce, 2013) The common strategy adopted by the container carriers is mixed fleet strategy wherein the portion of the container maintenance work is outsourced to third party vendors. This segment of the industry is highly capital intensive; and increasing fleet capacity would mean more capital required for the maintenance. ROCE for this segment stands at around 9%. Vessel Operators: Vessel operators own the ships and operate the ship transport from quay to quay. Vessel operators either provide their own ships to carry out the shipping operations or they lease out the ships to other container operators. Other activities performed by the vessel operators include managing the vessel crew, paying navigation charges, spending on harbour pilot services, etc. Vessel operation is also a capital intensive industry with estimated ROCE of around 3%. One of the reasons for the low ROCE is the utilization of the shipping capacity. Globally, container carriers operate at around 48% of their owned slot capacity and lease out the remaining capacity to the other freight forwarders. Terminal and Port Operators: The forth important segment of the shipping value chain is the port and terminal operations. The major activities in this segment are loading and unloading containers from vessels, storage of the containers at the terminals, loading containers for inland transport, etc. Terminal port operations are considered to be the high risk activities and major spend is incurred in ensuring the safety of the terminal crew and container material. Estimated ROCE for this segment is at around 25%. Major shipping players handle their own terminal and port operations to assure guaranteed birthing capacity in vessels. For example, APM terminals is an entity owned by Maersk Line group which manages the terminal and port operations for Maersk Line and other container carriers. Inland Delivery/ Container Inland Services (CIS): The final segment in the shipping value chain is Inland services which is responsible for movement of containers from the ports to the consignee. Container carriers generally rely on the separate entities to manage the inland transport of the containers from ports to the destination. These activities are least integrated with the other operations which are highly asset intensive and thus experience a relatively higher ROCE. The focus of this research is mainly on the container carriers responsible for transporting containers from source to destination. Maersk Line, CMA CGM S.A., China Shipping Container Lines and Mediterranean Shipping Company are the major container carriers which are referred frequently in this research document. Research problem explains the knowledge gap to be addressed by the research. In the context of this research, the research problem would address the issues related to the financial and operational issues faced by the container carriers and the way ahead for them. determine the industry outlook based on the prior trend and…………. This entry was posted in Management (MBA) and tagged Global Container Shipping Industry, Supply chain management Assignment Help Samples. Bookmark the permalink.